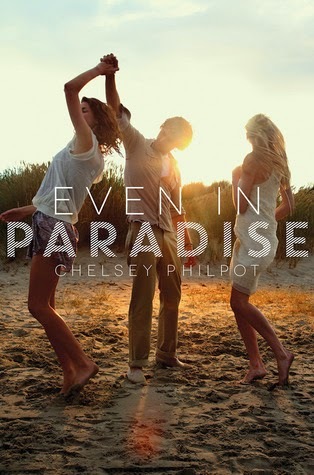 Even in Paradise begins with two girls, Charlotte Ryder and Julia Buchanan, meeting at the beginning of their junior year at St. Anne’s and forming an instant friendship. But then it becomes so much more. The author, Chelsea Philpot, explores the delicate balance of new and old friendships, family, relationships & sexuality, discovering who you are and want to be and making tough decisions because of that knowledge. And Philpot manages to do this in a way that felt natural and real and is so nuanced. Every person and every moment adds something to this story and the result is amazing. When Charlotte and Julia meet, Charlotte already knew who she was. Julia is notorious at their school for being the former senator’s popular, rich daughter so the last thing she expects is to become friends with her. I liked Charlotte right away. She wants to pursue art, has a great group of friends and a supportive family which consists of her dad, stepmom and two younger brothers. But then Julia turns out to be this complicated, kind and fun girl and they really connect. Everything else in Charlotte’s life - friends and spending time with her family - starts to slip away as she becomes enthralled with Julia and the whole Buchanan family soon after. And I understood how that could happen without Charlotte meaning it to. The friendship between her and Julia was certainly real but I think at a young age (or maybe any age), there’s also something really nice about being needed. As the story progresses, it’s clear Julia needs Charlotte as a stabilizing figure in her life although we don’t know the full extent of the reasons until later. This is emphasized by the Buchanan family who welcome Charlotte wholeheartedly and treat her as one of their own. The Buchanan family is this larger-than-life presence in the book. I was just as drawn to them as Charlotte was. There are the parents, little sister, older brothers, especially Sebastian (love interest alert!) and the author goes into detail about their family dynamic, nicknames and their banter. It made reading about them so personal. I loved feeling like I knew this family. But that can be said for most of the characters, including Charlotte’s family and friends. Like instead of just letting her old friends slip away from the story, they remain important and have scenes most people will relate to. Especially if you know what it’s like to hit a rocky patch with a friend. I just can't say enough how much I enjoyed this author's writing. None! I was surprised by how much I enjoyed it! It wasn’t what I expected it to be at all. I do! I honestly have so much more that I could say. I mean, I didn’t even say anything about the romance! (Again, so realistic.) I highly recommend. Do you still have a stuffed animal from your childhood? In the book, Julia has a stuffed animal that she's really attached to so we thought that would be a fun thing to talk about today. I actually have a childhood stuffed animal I'm very attached to. It looks like a puppy golden retriever which I've had since I was 10 and it's named Comet (after the Full House dog). It's the one stuffed animal I always had on my bed as a child and a teenager. I took it with me to college and even when I moved out to my current apartment, I knew I couldn't leave it behind. Except now it lives in my closet.